At least 19 people were missing and 120 people were injured in Hokkaido after the magnitude 6.7 quake, it said. At least 20 other people were injured in nearby towns. People said they felt a sudden large upthrust followed by a long shaking shortly after 3 a.m. and were anxious about continuing aftershocks in the region. In June, a deadly tremor rocked the Osaka region, killing five people and injuring more than 350. The quake left nearly three million people without power after damage to a major thermal plant supplying the region, with Industry Minister Hiroshige Seko saying it could take "at least a week" for supply to be restored. At least 16 people were dead or presumed dead after scores of hillsides collapsed, burying homes on the country's northernmost main island of Hokkaido. It may take a week to restore power fully to all residents, he said. The magnitude 6.7 quake early Thursday knocked out power to almost 3 million households and forced essential services such as hospitals and traffic lights to use generators or other backups. As a stop-gap while it is repaired, the utility operator restarted a thermal plant with less generating power as well as dozens of small hydroelectric plants. According to public broadcaster NHK, officials have lost contact with around 20 people near the epicentre and an 82-year-old man died after falling down the stairs at his home during the quake. The station's fuel rods are being cooled with emergency power supplied by diesel generators, Chief Cabinet Secretary Yoshihide Suga told reporters on September 6. No abnormality has been confirmed in radiation levels around the plant, regulators said. The Nuclear Regulation Authority said there was no abnormality at the plant, which has been idled since 2012 for routine safety checks, its reactors emptied of fuel. Hokkaido Electric Power Co, the monopoly electric company of the island, had to perform an emergency shutdown of all its fossil fuel-fired power plants after the quake, leaving its 2.95million households without power for the first time since it was created, in 1951. Bullet trains and local train services were also disrupted. "We can not reach the Sapporo bourse through land-line phones and officials are exchanging information via mobile phone", said an official of the Tokyo Stock Exchange, which provides trading system services to the local exchange. 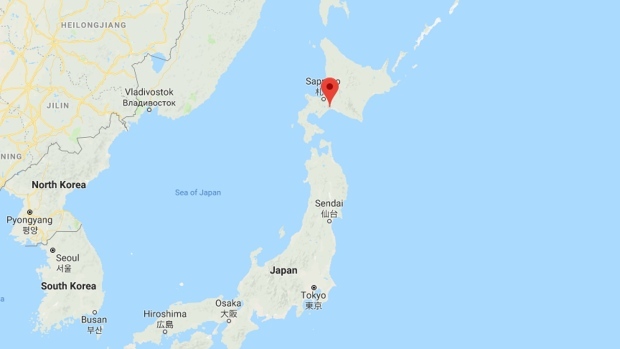 A fire broke out at a Mitsubishi Steel plant in the city of Muroran after the quake but was mostly extinguished with no injuries, a company official said. According to the US Geological Survey, the natural disaster struck around 68 km southeast of Sapporo. Japan's minister for the economy, trade and industry Hiroshige Seko told reporters that efforts are underway to try to restore power in Hokkaido. All trials scheduled for the day at Sapporo courts were canceled, while the Sapporo Securities Exchange has halted all trading and said it does not know when it can resume services. Power was knocked out across the island. Kirin Beer and Sapporo Beer both said factories were shut by the power outage, although they said no structural damage was found.